The result of these Awards is the most independent and rigorous assessment of wedding suppliers in the country by the people who count - the Brides and Grooms who booked them for their weddings. ...from the day we first rang through to the wedding day they made everything so unbelievably easy. Keith's ideas where great and the food he produced was out of this world. It didn't just stop with the catering - any extras we needed Keith sorted at the drop of a hat. We also just wanted to thank you so much for a truly wonderful wedding reception and breakfast. We have had so many comments about the food. One of our friends in particular commented that he had been to 8 weddings over last year and the food at our wedding was by far the best of all of them! It was delicious and your staff were so good and so helpful. You were also so patient, particularly with our seemingly neverending debate about where to have the champagne reception! Thank you for helping making our day so very special. We will have absolutely no hesitation in recommending your new company to any friends we know who are getting married locally. I thought that Keith did an absolutely superb job for our wedding. When we were in the initial planning stages, he had lots of really helpful suggestions about the sort of food that we might want and he understood exactly what we were trying to achieve. Keith also helped me out with information about local suppliers for other things that I needed to arrange for the reception; he even lent us a fridge! On the day, he not only made sure that everything went smoothly, but he also liaised with our band and entertainers so that I didn't have to worry about telling people where to set up and when. He sort of became our wedding co-ordinator for the day! Attention to detail was excellent, the presentation of the food was beautiful and it tasted excellent; he got one of the waitresses to bring a plate of canapés up to me during the champagne reception as I couldn't get near the food because I was talking to so many people; and when my husband wanted a dish that I didn't want - Keith made him an individual serving just for him! I wouldn't hesitate to ask Keith to cater for any events that I have in the future. ...a true talent for managing a banquet! We wanted to choose all local and seasonal ingredients for our wedding reception dinner, and Keith was brilliant at designing a menu along those lines that didn't exceed our budget. The end product was everything we'd hoped for! The starter was delicious and light, perfect for the hot summer afternoon we had for our outdoor reception. Our guests swooned over the belly pork! Even our friends who don't eat pork gave it a try and loved it! And the inventive Pimm's jelly dessert was an ideal summer selection to end with. He was perfectly attentive to our needs -- meeting with us and helping us to plan well in advance of the busy summer wedding season, suggesting alternative dishes for special dietary needs, providing all logistical support for the kitchen, having his team ensure guests' wine glasses were filled throughout the dinner, assisting us with managing the bar after the meal. We recommend Keith to anyone wanting quality British cuisine with a professional and caring approach! The Caravan Club has had the pleasure of working with Keith and Amanda on a number of occasions over the past few years. Keith is not only a wonderful chef, but his attention to detail regarding event management, and the advice he offers, is superb. They are both consummate professionals, no job is too big or too small, and the same care and attention is given to functions of all sizes. Keith uses locally sourced ingredients and the results are exceptionally appetising! 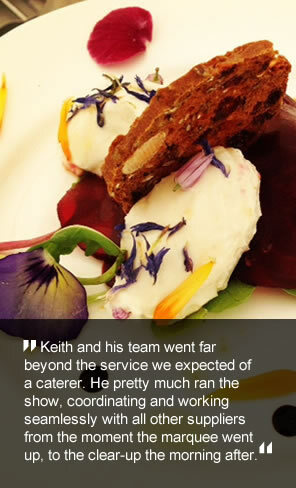 I would have absolutely no hesitation in recommending Keith and Amanda Mickleburgh for any catering function. Event organisers and guests will most certainly be hugely satisfied.